For the gear screen(NA)[a] or equipment screen(EU/OC)[b], see Equipment. Gear is the combined form of headgear, clothing and shoes that Inklings and Octolings can wear. Gear comes with various abilities that provide effects for the player in battle. Gear can be acquired in shops, through SplatNet 2, through amiibo, ordered through Spyke or Murch, or by other means depending on the item. Each piece of gear has a brand and a rarity that affect its abilities. Most brands have an increased likelihood of rolling a particular ability when a slot is unlocked, as well as a decreased likelihood of a different ability. The rarity affects how many ability slots a piece of gear has by default and the amount of experience required to unlock those slots. The primary source for gear is in shops. Shops include Booyah Base in Splatoon and the Galleria in Splatoon 2, both of which contain stores for headgear, clothing and shoes. Items purchased from shops will always have their default main ability and number of ability slots, but shops offer the lowest prices on gear items. Shops sell gear for cash. On any given calendar day, a shop will have a selection of items for sale. The items available will be selected at random from the pool of items that the player is eligible to buy. The items available in the shop cycle out at midnight according to the system clock. The exact items a player is eligible to buy depends on their level. Items that are already owned cannot be purchased again from shops. Gear can be ordered through Spyke and Murch. While interacting with other Inklings in Inkopolis Plaza (Splatoon) or Inkopolis Square (Splatoon 2), players can order gear. After midnight according to the system clock, Spyke or Murch will have the next ordered item available for purchase. Players can have up to three gear items ordered at a time, but only one order will be fulfilled each calendar day. The first item ordered will be the first order fulfilled. The items offered for purchase by Spyke or Murch may not have the same abilities as the ordered gear item, and the price will be significantly more than the item would cost in its respective shop. In Splatoon 2, players can use SplatNet 2 to order gear with main abilities not otherwise available for any given item. Gear ordered this way can immediately be purchased through Murch in-game. Six gear items are available for order at a time. Every two hours, a new gear item is made available and the oldest gear item is removed from the list. Only one gear item can be ordered from SplatNet 2 at a time: ordering a second item will cancel the order for the first one. Each piece of gear has a main ability and up to three secondary abilities. Items ordered from SplatNet 2 will always have their main ability be different from the ability that ordinarily appears on that gear item. The default number of secondary ability slots is determined by the rarity of the gear item: a 1-star item will have one secondary ability slot and so on for 2- and 3-star. If fewer than three secondary ability slots are present on a gear item, additional slots can be added by Spyke or Murch. By default, secondary ability slots are locked and have no ability. Through online battles, gear will gain experience and ability slots will be unlocked. The gear item's rarity determines the amount of experience required for each slot. When a secondary ability slot is unlocked, a random ability is rolled for it. For most gear brands, a specific ability is five times as likely to be rolled while another specific ability is only half as likely to be rolled. The following chart shows the amount of experience required to unlock a secondary ability slot on a gear item with a given rarity. Numbers in italics represent ability slots that must be added by Spyke. The following chart shows the amount of experience required to unlock a secondary ability slot on a gear item with a given rarity. Numbers in italics represent ability slots that must be added by Murch. Unlike all other items, Splatfest Tee requires 7,500 points for each slot for a total of 22,500 points. In 2017, 7-Eleven sold exclusive Splatoon 2 merchandise in Japan through their website. Purchased items were also accompanied by a download code for exclusive in-game gear. 7-Eleven exclusive gear items cannot be ordered through Murch. In the press release, it was mentioned that these items may eventually become rewards available through My Nintendo after 2018. CoroCoro Comic is a Japanese comic and video game magazine. Version 2.8.0 of Splatoon featured CoroCoro-themed promotional gear. This gear became accessible in-game from shops, and can be ordered through Spyke. The January 2018 issue of CoroCoro Comic included unique product codes that could be used in the Nintendo eShop to redeem promotional gear in Splatoon 2. These CoroCoro Comic exclusive gear items can only be used with the Japanese version of the game and cannot be ordered through Murch. These items resemble the signature outfit of Emperor, an antagonist in the Splatoon manga. The August 2018 issue of CoroCoro Comic included unique product codes in a Spygear License Card that could be used in the Nintendo eShop to redeem promotional gear in Splatoon 2. These CoroCoro Comic exclusive gear items can only be used with the Japanese version of the game and cannot be ordered through Murch. These items resemble the spy outfits worn by Blue Team during the Octo Expansion arc in the Splatoon manga. Japanese magazine Famitsu has held contests for reader-submitted designs to be implemented in Splatoon games. Gear added in this way becomes accessible in-game from shops, and can be ordered through Spyke and Murch. Famitsu also gave away codes for promotional gear for those who purchased the the Fourth Splatoon Koshien Fan Book. These can only be used with the Japanese version of the game and cannot be ordered through Murch. With the release of Splatoon 2, a promotional collaboration with licensed merchandise producer HORI saw the HORI Splatoon 2 Splat & Chat Headset, for use with the Online Lounge. An in-game gear item with the same design is accessible in-game from shops, and can be ordered through Murch. The King of Games is a brand of apparel by Japanese apparel manufacturer Editmode that produces officially-licensed Nintendo clothing. From launch, Splatoon has included a KOG brand that sells in-game analogs to real-world products. This gear is accessible in-game from shops, and can be ordered through Spyke. On 16 March 2018, a Splatfest was announced for Splatoon 2 in Japan with a theme inspired by real-world Nike shoe products. As part of the promotion, two new gear items were added to the game. This gear became accessible in-game from shops, could be ordered through Murch, and were immediately listed for order on SplatNet 2. These are the only gear items to ever appear on SplatNet 2 with their regular price and abilities. Version 2.0.0 of Splatoon featured gear inspired by Squid Girl, a Japanese manga and television show. This gear became accessible in-game from shops, and can be ordered through Spyke. During the initial Splatoon Global Testfire event, players who pre-purchased Splatoon in-game would receive gear to distinguish them from most other players. The upgraded gear was only cosmetic and offered no practical advantage. When the Octo Expansion DLC for Splatoon 2 was announced, promotional gear was immediately available to players who pre-purchased the expansion. Both in Splatoon and Splatoon 2, over half the gear is clothing. In Splatoon, exactly half the clothing is . In Splatoon 2, there is only one fewer item than there are items (140 versus 141). In Splatoon 2, the most common primary ability on headgear is Special Saver (seven items) and the most common primary ability on shoes is Bomb Defense Up (eight items). For clothing in Splatoon 2 and all the categories in Splatoon, there are at least three different abilities which are the most common for that category. In Splatoon, the brand that produces the most headgear is Forge (fourteen items), the brands that produce the most clothing are Splash Mob and SquidForce (sixteen items each) and the brand that produces the most shoes is Krak-On (thirteen items). In Splatoon 2, the brand that produces the most headgear is Forge (eighteen items), the brand that produces the most clothing is Splash Mob (nineteen items) and the brand that produces the most shoes is Tentatek (nineteen items). In Splatoon, five brands do not produce all three types of gear: Firefin, Forge, Skalop, SquidForce, and the real-world tie-in brand KOG. They all produce headgear and clothing but not shoes, with the exception of KOG, that only produces clothing. In Splatoon 2, only two brands still have this distinction: Skalop and SquidForce. 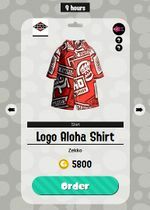 In Splatoon, every piece of special promotional gear, except for the CoroCoro gear, is produced by a special brand (for instance, the SQUID GIRL Gear is produced by The SQUID GIRL). In Splatoon 2, this is not the case. Every piece of special promotional gear is produced by an existing brand that is not associated with special promotions, most commonly Forge, which produces eight pieces of promotional gear in-game. Of the 205 items appearing in both games, 25 had their rarity changed (eight raised, seventeen lowered). All gear that appears in both games that had Bomb Range Up in Splatoon has Sub Power Up in Splatoon 2. The same is true for Defense Up and Bomb Defense Up; and for Special Duration Up and Special Power Up. The Splatfest Tee is the only piece of gear that had an ability in Splatoon ( Special Saver) that still exists in Splatoon 2, yet had its ability changed (to Ability Doubler, which is unique to it). Of the other four new primary abilities, Thermal Ink appears only on gear that is new to Splatoon 2, while the other three ( Drop Roller, Object Shredder and Respawn Punisher) appear only on new gear or gear that had Damage Up as its primary ability in Splatoon. This page was last edited on 26 March 2019, at 20:14. This page has been accessed 1,042,467 times.